The Academy structure at Kelley “leads to better interview preparation and therefore more companies being interested in coming to campus.” Couple that with the “broad Hoosier network” and a “top marketing program with fantastic companies coming on campus” and it’s easy to see why Kelley has “unrivaled exposure to best-in-class CPG companies (Kraft, General Mills, P&G, Nestle, ConAgra).” Add to that a “strong entre­preneurship program and international experience opportunities,” as well as faculty who will “bend over backwards to help you land that job/internship,” and opportuni­ties abound. Students don’t need to rely solely on the faculty, either. They can also rely on one another. “Many students find internships and full time offers because their class­mates helped them make the right connections.” The biggest recruiters of students here include Cummins, Deloitte, 3M, Ernst & Young, and General Electric, and those MBAs went on to a wide range of positions: In 2011, about one-fifth wound up in consumer products; 13 percent took positions in technolo­gy; 18 percent were in manufacturing; 13 percent found financial services gigs; and 18 percent were hired for consulting. Benecki Center for Real Estate Studies; Center for Brand Leadership; Center for Econometric Model Research; Center for Education and Research in Retailing; Center for Global Sales Leadership; Center for International Business Education and Research; Center for the Business of Life Sciences; Indiana Business Research Center; Information Management Affiliates; Institute for Corporate Governance; Institute for Global Organizational Effectiveness; Institute for International Business; Johnson Center for Entrepreneurship and Innovation; Tobias Center for Leadership Excellence; Business Marketing Academy; Consulting Academy; Consumer Marketing Academy; Corporate Finance Academy; Investment Banking Academy; Investment Management Academy; Supply Chain and Global Management Academy; Entrepreneurial Management: Venture Development, Corporate Innovation, and Emerging Life Sciences Academy. Second-year students provide tutoring support to first year students on an as-needed basis. Wits Business School, Johannesburg, South Africa; China Europe International Business School, Shanghai, China; Guanghua School of Management, Peking University, Beijing, China; Fudan University, Shanghai, China; Hong Kong University of Science and Technology, Hong Kong; Nanyang University, Singapore; National University of Singapore, Singapore; Melbourne Business School, Melbourne, Australia; Copenhagen Business School, Copenhagen, Denmark; HEC School of Business, Jouy-en-Josas, France; Manchester Business School, Manchester, England; Norwegian School of Economics and Business Administration, Bergen, Norway; Universita Bocconi, Milan, Italy; University of Cologne, Cologne, Germany; University of St. Gallen, St. Gallen, Switzerland; Vienna University of Economics and Business Administration, Vienna, Austria; Warwick Business School, Warwick, England; Tel Aviv University, Leon Recanati Graduate School of Business Administration, Tel Aviv, Israel; Fundacao getulio Vargas, Sao Paolo, Brazil; Pontificia Universidad Catolica de Chile, Santiago, Chile; ESAN Graduate School of Business, Lima, Peru; York University, Canada; and St. Petersburg University, Russia. 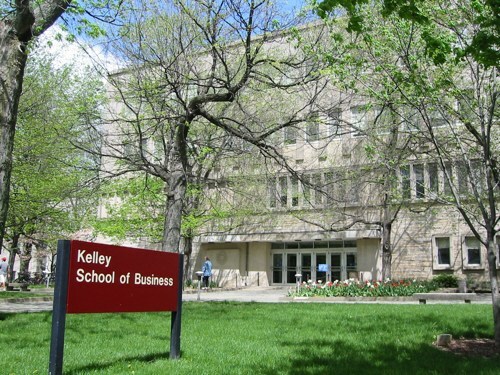 John T. Chambers - MBA 76, Chairman and CEO, Cisco Systems, Inc.
Want more info about Indiana University - Bloomington Kelley School of Business Distance MBA? Get free advice from education experts and Noodle community members.